Don’t you miss the days when you needed to take the camera film to a developing store before you can see that you blinked in that one family photo? If you do, Robert Brunner, an influent Silicon Valley designer and founder of design firm Ammunition, shares your nostalgia. “Very few people print pictures anymore,” he says. And he’s right; in an era when we scroll through, tap on and forget hundreds of pictures every day, it’s difficult to regain that sense of value when it comes to photography. Before pictures were taken for showing off on social media platforms, or at a party where you pass the phone around, photos actually represented a physical artifact of a memory, a keepsake that reminded you of a special occasion. But Brunner refuses to believe that retro instant photography is no longer an interest for the smartphone-carrying generation. His design firm works with Polaroid and other companies that try to keep the business alive by imagining innovative ways of reviving old-fashioned photography. Their latest attempt at revamping the vintage instant photography business is a collaboration between Ammunition and Polaroid. The Polaroid Snap – available at only $99 – is the pet project of Brunner and senior designer Jonas Logerstedt. 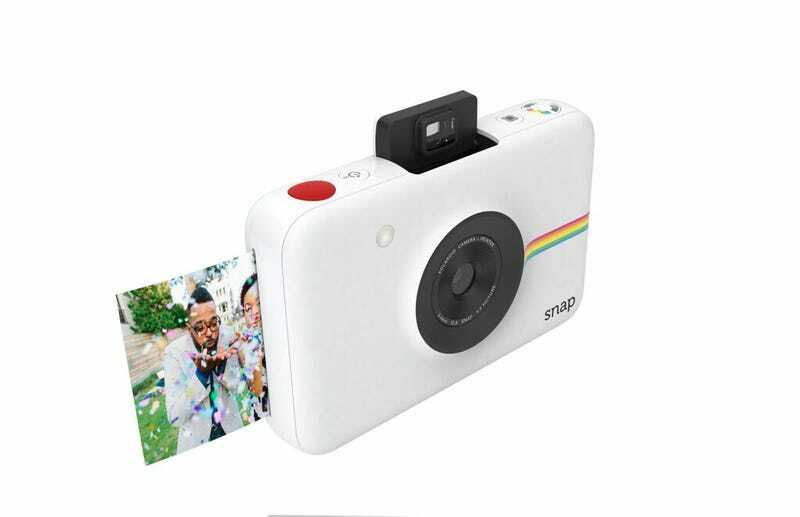 After delivering other two designs for Polaroid last year – the Zip instant mobile printer and the Cube action camera – the Snap chimes in as a clearly modern instant camera. What’s really intriguing is Ammunition’s decision to skip ink cartridges altogether, which has been replaced by inkless printing tech. The special photo paper that usually goes with the Polaroid cameras is still mandatory, however. The Snap really goes against the trend; in a time when a dedicated point-and-shoot is considered redundant, Brunner’s concept invites users to enjoy its simplicity. On top of that, the Snap offers no image customization in the form of filters or editing options, not even the basic tools that have made Instagram popular. All you’ve got with the Snap is three filter buttons: one for color, one for black-and-white, and one for sepia filters. But size is where the new camera really takes home the prize: it fits right in the palm of your hand, exactly like a phone does.